The TeamViewer integration for AppTec360 enables screen sharing and remote control support for many Android, iOS, macOS, and Windows desktop/mobile devices from within the AppTec360 Console. With TeamViewer, you can easily create a secure remote support session directly from your AppTec360 console and streamline remote administration. Remote troubleshooting is enhanced by optimizing communication between employees and IT administrators so that end users get the best possible support from their IT administrator. With this integration, users no longer have to verbalize their problems, and helpdesk staff no longer have to blindly identify problems. This simplifies device management many times over. Simply enable the integration within the AppTec360 administration console, and then follow the steps to link to your existing or new TeamViewer license. 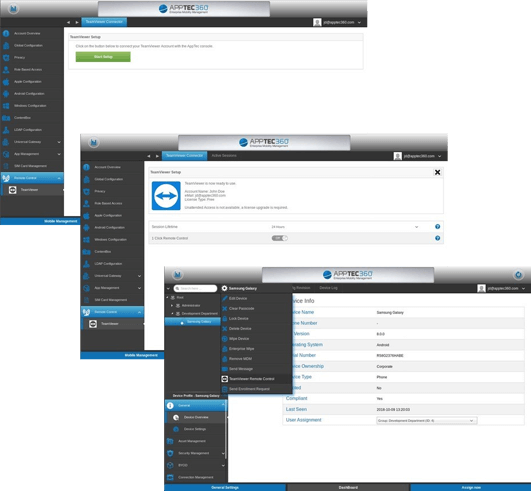 View TeamViewer enablement in the AppTec handbook.